A report has revealed over one in 200 pregnancies ends in a stillbirth, a figure which has remained unchanged since the early 1990s. 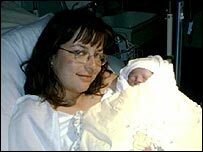 Carolyn Bray's daughter Rebecca was stillborn in 2002. She says: "It was my second pregnancy. I already had a son who was four at the time. "I was full-term, just over 38 weeks pregnant, and I'd had a trouble-free pregnancy. "I'd been induced in my first pregnancy, so I didn't know what going into natural labour was like." Carolyn, from near Boston in Lincolnshire, was at a car boot sale when she began to have cramping pains, but she didn't think there was anything wrong. "But when I couldn't bear it any more, I rang the hospital and they asked me to come in straight away. "They soon discovered that I'd suffered a concealed placental abruption - where the placenta comes away from the wall of the womb and bleeding occurs internally." Placental abruption is one of the known causes of stillbirth, because the baby loses its source of nutrients and oxygen supply. Carolyn's condition also started to deteriorate rapidly due to the severity of the abruption. Her organs started to shut down, which doctors said was as a result of her body fighting the "foreign" substance of her baby's blood, which was now mixing with hers. As a result she had to have a number of blood transfusions to replace the blood she had lost. She then gave birth to her baby naturally. "It was the fourth of June, 2002. I had a little girl, who we named Rebecca. "She was perfect in every way and just looked like she was asleep. "Never hearing her cry and seeing her grow up is so hard to live with. We were having to say goodbye before we'd really had a chance to say hello. It was all wrong. "I was just in complete shock. I felt utterly devastated. And I felt completely disengaged from myself. It was a very scary time both emotionally and physically. "I couldn't believe this had happened. "Only hours earlier I'd been talking excitedly with a friend about the imminent arrival, but in a matter of hours our lives were literally torn apart." Carolyn and her husband were given time with their daughter. But she says there are things she regrets not doing. "I never saw her naked - I never saw her feet. "This might sound irrelevant to an outsider, but it is very important to me." Pictures of Rebecca also take pride of place with those of the couple's other children in the family home, and Carolyn says they often talk about her. Her experience led Carolyn to turn to the Stillbirth and Neonatal Deaths Society (Sands), whose help she says was invaluable. She now works for the organisation as a fundraiser.